Renowned author Sylvia Plath was born in Boston, Massachusetts, and studied at Smith College. In 1955 she went to Cambridge University on a Fulbright fellowship, where she met and later married Ted Hughes. Plath, who lived from 1932 to 1963, published one collection of poems in her lifetime, The Colossus (1960), and a novel, The Bell Jar (1963). Her Collected Poems, which contains her poetry written from 1956 until her death, was published in 1981 and was awarded the Pulitzer Prize for Poetry. Other posthumous publications include Ariel, her landmark publication, Crossing The Water, Winter Trees, Johnny Panic And The Bible Of Dreams, and The Journals Of Sylvia Plath 1950-1962. The critical and popular response to the recent publication of The Letters of Sylvia Plath Vol. 2: 1956-1963, which was the second thousand plus-page volume in a two-volume collection, illustrated the enduring passion for one of the most beloved literary giants of the 20th century. 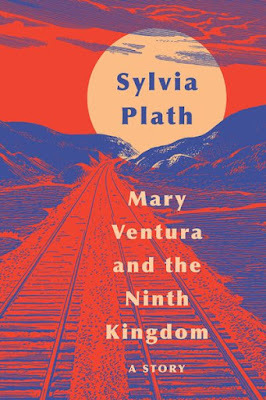 A newly-discovered short story, Mary Ventura and the Ninth Kingdom, was found in an archive by Judith Raymo, an archivist who specializes in Sylvia Plath material. She brought it to Faber and Faber in London, who knew nothing of this story and had never seen it. In fact, even Frieda Hughes, the daughter of Plath and Ted Hughes, was not aware of the story’s existence, either. It was clear very quickly that this mesmerizing tale was signature Sylvia Plath, her own rebellion against convention and struggle to control her own fate so vividly portrayed in its pages. Plath was still a student at Smith College when she completed this work in December 1952. Mary Ventura and the Ninth Kingdom is a mythic tale of the assertion of female agency. Its metaphysical and allegorical quality is unlike anything else she wrote. Cinematic and gripping, it is a rare treasure. Plath wrote, "The train shot into another subway tunnel, then,. Dark rocks bulked silent and swift past the window, and the wheels clocked away like the cogs of a gigantic clock. "The vendor stopped at their seat and pushed his red cap back on his forehead, sticking his thumbs in his red-and-white striped silk vest. "'What'll it be?' he began in a routine, bored voice. 'We have...' He paused, looked closely at the woman, and burst into raucous laughter. "'Large,' the woman replied, and handed him a quarter. "'Poor Bert,' the woman remarked to Mary, unwrapping the chocolate bar without tearing the fragile silver foil. 'He gets so lonely for someone to talk to on this run. It's such a long trip that hardly anybody makes it twice.' She broke a section from the chocolate bar and handed a large piece of the flat brown candy to Mary. The smell of the chocolate rose rich and fragrant. "'Mmm,' said Mary. 'It smells good.' She took a bite and let the candy dissolve on her tongue, sucking at the sweetness and letting the syrup run down her throat. "'I suppose you're right,' Mary admitted with a laugh. 'I hadn't thought about it that way. But tell me, what will it be like when we get off the train? I can't imagine. The travel folders don't say anything about the climate, or the people in the north country, nothing at all.'" Harper Perennial, a division of HarperCollins Publishers, acquired the North American rights to it. Terry Karten, SVP & Executive Editor negotiated the deal with Faber and Faber, the agent for Frieda Hughes and the Estate of Sylvia Plath.